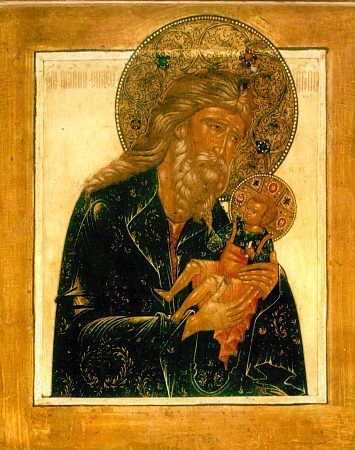 Righteous Simeon the God-Receiver (Bogopriimets) was, according to the testimony of the holy Evangelist Luke, one of the chosen of God in expectation of the consolation of Israel, and the Holy Spirit dwelt upon him (Lk 2:25). It was announced to him from God, that he would not die until that time, when the Promised Messiah – Christ the Lord – would be come into the world. Ancient historians relate that the Egyptian emperor Ptolemy II Philadelphos (285-247 BC) wished to add to the famous Library at Alexandria with texts of Holy Scripture. He invited scholars from Jerusalem, and the Sanhedrin sent their wise men. Righteous Simeon was also among the 72 scholars in Alexandria for the translation of the Sacred Scriptures into the Greek language. (The work was accomplished and received the title "Translation of the 72 Interpreters". With this also further on in the future, the New Testament was translated into the Slavonic language for the Bulgarian, Serbian and Russian Orthodox Churches.) Righteous Simeon translated a book of the Prophet Isaiah, having read in the original the words: "Behold, a Virgin shalt conceive and give birth to a Son" (Is 7: 14). He decided, that the word "Virgin" was incorrectly used here in place of the word "Woman", and he wanted to correct the text. At that moment an Angel appeared to him and held back his hand saying: "Have faith in the words written down; thou thyself shalt be persuaded that they will be fulfilled, whereof thou shalt not taste of death until thou behold Christ the Lord, Who shall be born of a Pure and Immaculate Virgin". From this day righteous Simeon began to await the coming of the Promised Messiah. And here one day righteous Simeon, knowing of it by the Holy Spirit, was come to the Jerusalem Temple. It was on that very same day (the fortieth after the Birth of Christ), when the All-Pure Virgin Mary and Her Betrothed Joseph had come there in order to perform the ritual set down by Jewish Law – to present before the Lord His Own Divine First-Born and to offer the established sacrifice. When righteous Simeon beheld their arrival, the Holy Spirit revealed to him that the God-Infant Whom the All-Pure Virgin Mary held, – was the Promised Messiah, the Saviour of the world. The elder took into his arms the Infant Christ and pronounced his prophetic words: "Now lettest Thou Thy servant depart, O Lord, with peace according to Thy word, wherefore hath mine eyes beheld Thy salvation, which Thou hast prepared before the face of all peoples, a light to the enlightening of gentiles and the glory of Thy people Israel". He blessed the All-Pure Virgin and Righteous Joseph and, having turned to the Mother of God he said: "Behold, This One is set for the fall and rising up of many in Israel and for the sign spoken against, and for Thee thyself a sword shalt pierce the soul, so that the thoughts of many hearts might be revealed" (Lk 2: 22-35). 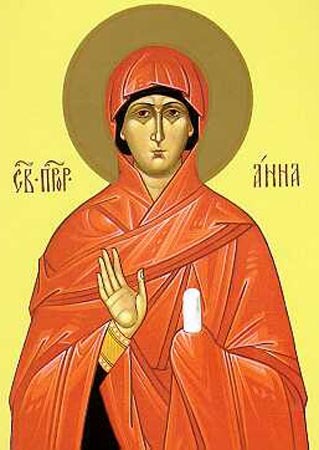 The holy Evangelist relates further: "Here also was Anna the Prophetess, daughter of Phanuel from the tribe of Aser, having reached extreme old age, having lived with her husband for seven years, she was a widow for eighty-four years, who went not out from the temple, serving God both day and night by fasting and prayer. And she having approached at this time, glorified the Lord and prophesied about Him to all awaiting deliverance at Jerusalem" (Lk 2: 36-38). About the righteous and holy Simeon the God-Receiver is known that he died in extreme old age. In the VI Century his holy relics were transferred to Constantinople. In the year 1200 his grave was seen by the Russian pilgrim Saint Antonii, future archbishop of Novgorod (1212-1220. +1232, Comm. 8 October).